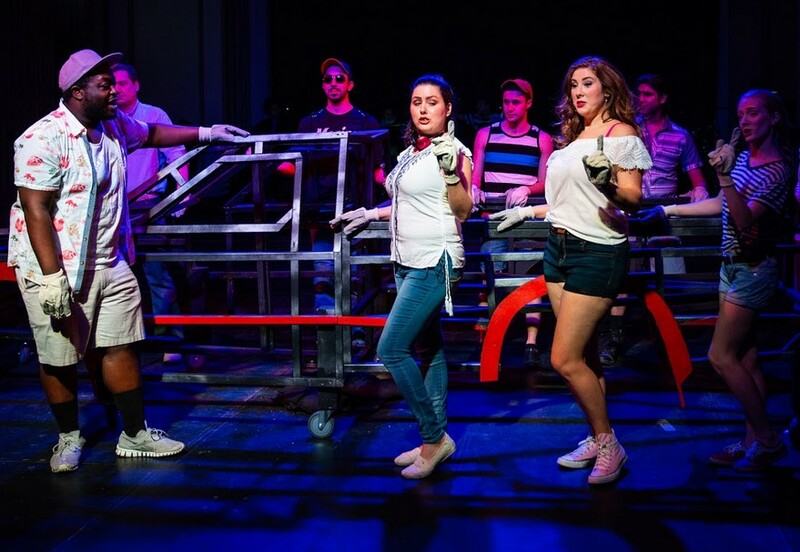 Although it contains several fine songs, in full Hands on a Hardbody isn't a fantastic musical. 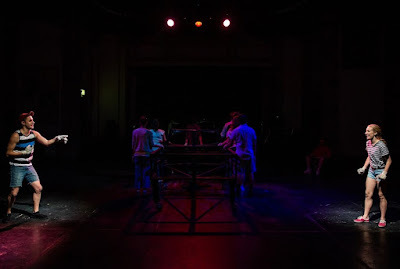 And though the rendition by Refuge Theatre Project in Chicago has several excellent vocal performances, as a production it feels more solid than spectacular (and was marred by audio problems on opening night). 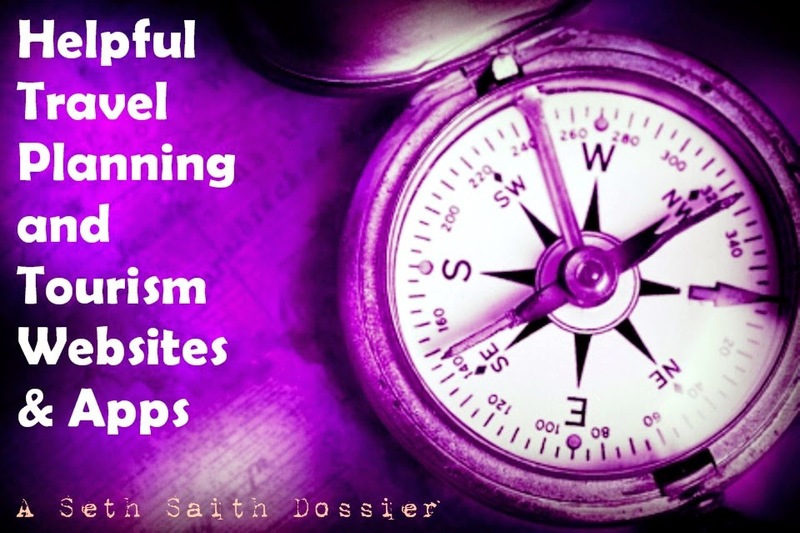 Still, it is an enjoyable endeavor that I found endearing and worth recommending on several levels. 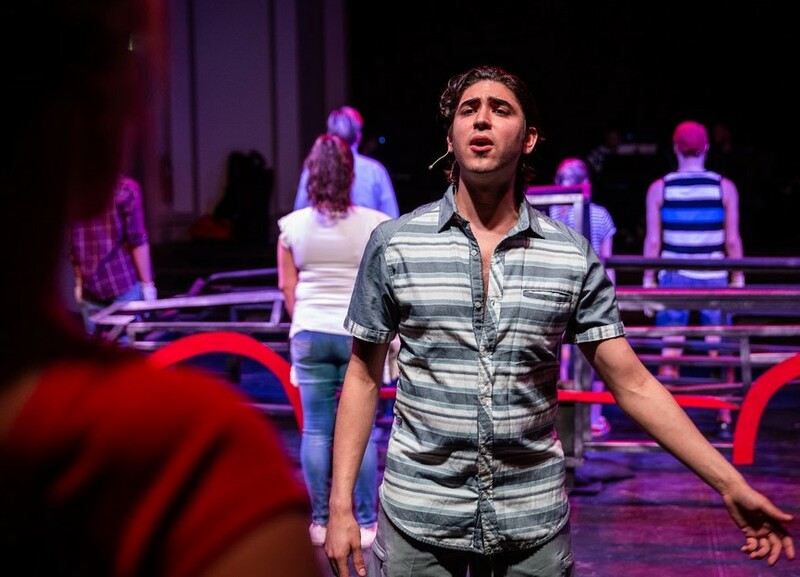 Though I've attended shows by dozens of theater troupes in and around Chicago, I never before had heard of Refuge, which professes to specialize in "Under-produced, under-appreciated musical theater." As a musical that opened on Broadway in early 2013 and closed after just 28 official performances, and--to my knowledge--had yet to be seen in Chicago proper, Hands on a Hardbody would seem to qualify. Based on S.R. Bindler's 1997 documentary about an endurance competition in Texas in which contestants aim to keep one hand on a pickup truck for the longest amount of time, the musical notably features music by Trey Anastasio, the guitarist and singer of popular jam band, Phish. Amanda Green, who wrote the lyrics, is credited with co-writing the score with Anastasio. And the show's book writer, Doug Wright, won a Pulitzer Prize for his play, I Am My Own Wife. 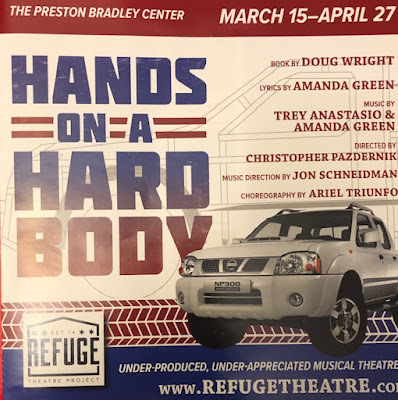 So particularly in just having put together a blog piece and Spotify playlist noting how rock music has been infused into original Broadway scores of late--I didn't include any of Anastasio's compositions--I was rather intrigued to see Hands on a Hardbody for multiple reasons. Even the venue utilized by Refuge coolly counts as one of those, as the show is being staged in a grand room on the 4th floor of the Preston Bradley Center in Uptown. A nice group number, "Human Drama Kind of Thing" opens the show providing an overview of the contest, and is really the only song in which Anastasio's trademark guitar work stood out to me. Which isn't to say several of the other tunes weren't good, but anyone explicitly expecting a "Phish musical" likely won't be hooked. Essentially, each of the contestants--and in a couple cases, their spouses--sings a song outlining their reason for being in the competition, their aspirations, etc., and each tune in this production is deftly handled. I particularly liked Judy Lea Steele--as Virginia Drew, wife of contestant J.D. Drew (Tim Kough)--belting out "Alone With Me," and Alli Atkenson (as Kelli) and Roy Samra (Greg) do a fine job on "I'm Gone." Max Cervantes plays an ex-Marine named Chris, whose "Stronger" is quite poignant, while Cathy Reyes McNamara (as Norma) leads a gospel number called "Joy of the Lord." Derek Fawcett is Benny Perkins, a former contest winner back for another try, while Molly Kral (Heather), Jared David Michael Grant (Ronald), Sebastian Summers (Jesus Pena), Dan Gold (Mike Ferris, a contest host) and Jenna Fawcett (Cindy, a co-host) also do impressive work. I am not familiar with the documentary, so I don't know how closely the characters in the musical hewed to real-life contestants. But it felt like there should have been more diversity represented beyond a few Hispanic characters or actors and one African-American man. For as the audience gets to know each of the contestants, they get to know each other, and it seems such a tale celebrating individuality and eye-opening interaction might include a wider range of characters (Muslims, homosexuals, transgender individuals and/or those with physical impairments). I didn't come to care about any of the contestants more than any others, and was never compelled to wonder who the eventual contest winner might be. Understanding that Refuge is probably presenting this show on a fairly limited budget, I also saw spots where director Christopher Pazdernik--who is also the company's artistic director--might have been a bit more imaginative with the staging. Just as one example, as the somewhat older Drew couple reflects on their lives together on "Alone with Me," why not have a couple dancers representing the youth gone by? This isn't that original a concept and I don't know what choreography may have been created for the Broadway production, but with rather little innate visual interest given the characters largely being tethered to the pickup, some inspired variance would be nice. And hopefully it was just an opening night glitch, but several microphones couldn't be properly heard, and loud crackling was unfortunately too present. 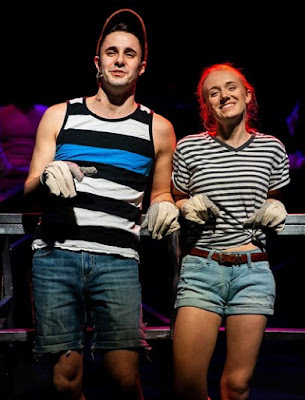 Despite the flaws, I want to be clear that I admire the efforts of Pazdernik, cast and crew in not only presenting this musical, but in providing a rather solid sense of it. 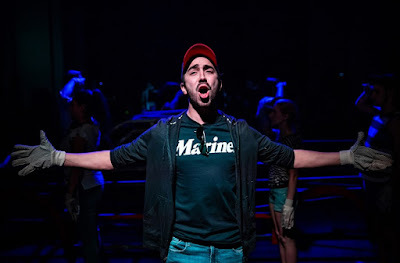 Beyond its technical merits--and to some degree, lack thereof--I'm happy to have seen Hands on a Hardbody, and I think it should be worth your time as well. Especially as you'll spend just 2-1/2 hours in the theater, not several days attached to a pickup truck.